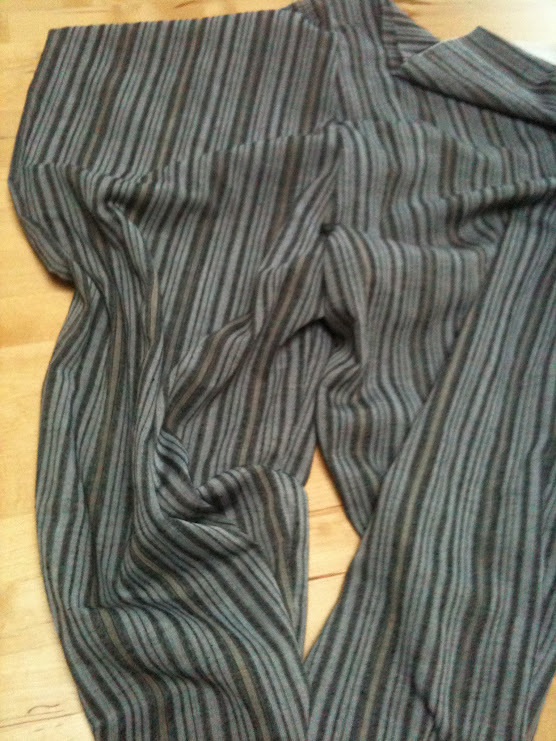 I’ve started a pair of pyjamas for my husband, with one of the striped fabrics I bought on Sunday. I’m using the free pattern by Simplicity #0501. Of course, he thinks it’s too large at the hips and legs! This man is only ever wearing jeans so he probably forgot how it feels to have loose-fitting trousers of any kind. So I will be pinning the legs and thus creating a side seam where there wasn’t any. Atfer that we’ll work on the elasticated waist (I’m not using drawstring) and the hems. When he tried the trousers on, he asked me « why aren’t the seams serged? », cheaky man! As he’d think I would finish my seams before he even tried them on! I have received Tasia’s new Sewaholic pattern: the Cambie Dress. I’m still stunned by the rapidity of joint Canadian and French postal services on this one: posted on tuesday, arrived the next monday. When I think that a single letter can take up to 5 days to cross France, I’m amazed! It means that I can start playing with the pattern right now! Yesterday I traced the pattern (I’m always worried of cutting a pattern, especially when they are expensive or hard to get), grading from a size 12 at the bust and waist to a size 16 at the hips. 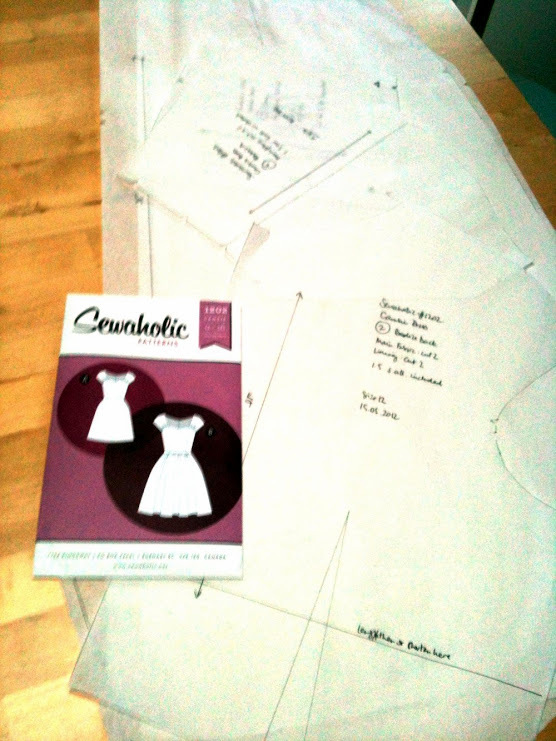 I’m planning to make a muslin to check the fit. I hope to be able to do that tonight, or maybe tomorrow as the pyjamas trousers are eagerly expected. Tomorrow is a bank holiday in France, it’s Ascension Day. I know, the month of May here is perfect for workers because there are so many bank holidays: 1st, 8th, 17th and 28th. The first two are « civil » and the others are Christian celebrations (Ascension and Pentecost). It means that in May I’ve only had one full week at work! wonderful! Plenty of time for sewing! 2. Force Carl to wear the pyjamas I made for him over the weekend. Oh and if they seem high waisted do not (and I say this from painful experience) fold the fabric over the elastic twice and sew down. I now have to seam rip-4 rounds of stretch stitch on quilted knit fabric XP..
Oh dear! ripping all that! The pyjamas ended slightly high waisted but I pinned the waist and it’s fine. Which was the reason why he was complaining about the many times he had to try them on to check for fit, waist, hem etc. poor man! Yours are very elaborate! Your husband will be extremely elegant in them 🙂 I’m not sure I could sew some like yours yet, mainly because my husband would be too eager to have them finished.. The whole point of pj’s is that they are loose! That’s what makes them comfortable. Crazy man, who wants to sleep in trousers? I know, weird isnt’t it?